Peek-a-boo!!! It’s Jojoba this time and it is here to reveal your natural beauty, hidden in the rear of your pimples, wrinkles, blackheads, sunburns, scars, microbial infections, skin pigmentation, psoriasis, cellular damages, dandruff, rough hair, chapped lips, and the list that never ends as you know. This is mainly due to the fact, “Jojoba oil is similar in structure to our natural sebum and such wonder plants used in natural cosmetics actually mimic the skin’s own functions,” quotes the book, ‘The New Age Herbalist – How to use herbs for healing, nutrition, body care and relaxation’ by Richard Mabey and Anne McIntyre. Trust me; Nature is extraordinarily miraculous in bestowing spectacular souvenirs like Jojoba, which is a woody evergreen shrub that grows in drought and scorching desert conditions. Bearing all the blistering heat around, Jojoba oil still enriches us with its enormous moisturizing and cooling attributes. Pronounced as ho-ho-ba, Jojoba oil is indeed a fluid plant wax that has replaced animal wax or whale oil since 1971 in the United States and across the world in the production of soaps, skin care creams, moisturizers, shampoos and an extensive range of cosmetics. Jojoba is used in various Complementary and Alternative Medicinal Practices including Ayurveda, especially in Abhyanga or the art of Ayurvedic massaging for ultimate relief and comfort from various ailments. Jojoba oil has the potent to balance vata, pitta and kapha doshas and is helpful in treating dry skin complaints, acne-prone skin problems and inflammatory conditions. Jojoba oil has fatty acids including ferulic acid, docosenoic acid, 11-Eicosenoic acid, oleic acid, docosdienoic acid, palmitoleic acid, erucic acid and 9-Godoelic acid. It has a rich presence of skin-nourishing nutrients like Vitamin E, copper, selenium, zinc, chromium, silicon, B-complex and iodine (82 per cent of this magical ingredient grants Jojoba the power to cure). Remedial values that make Jojoba the best among all the enriching massage oils are anti-inflammatory, emollient, moisturizing, cicatrisant, antioxidant, anti-degenerative, antifungal, antimicrobial, antiseptic, moisturizing, anti-acne, anti-dandruff and anti-aging. Simmondsia chinensis is the botanical name of Jojoba, a dry perennial shrub indigenous to the Sonoran desert of Northwestern Mexico and in Southern California and Arizona. It is also grown commercially in Peru, Argentina, Australia, Chile, Israel and Egypt. “Jojoba is the only known botanical wax, which is liquid at room temperature and an estimated 5,000 tons of Jojoba is used in personal care products manufactured around the world,” says the International Jojoba Export Council (IJEC). Jojoba is an excellent alternative to commercial whaling and this wonder plant save the whales from being killed for ‘whale oil and spermaceti.’ IJEC says that Jojoba oil is chemically similar to whale oil and both are pure, long-chain wax esters. The rich Jojoba oil is extracted from the crushed seeds of this shrub. Jojoba and its oil have also been in use as a promising skin conditioner, hair restorative, appetite suppressant and as a natural moisturizer. The founder of 21 California Missions, Father Junipero Serra quotes that the Native American populace have used Jojoba for a longer period in the treatment of burns, bruises, sores, wounds, sunburn, dandruff, hair fall and inflammatory scalp conditions. Not many people except the resident Americans along with the traditional masses of the Sonoran desert were aware about the many healing benefits of Jojoba oil. This oil was popularly known and has been used as a reliable source of antioxidant emulsions. The first International Conference on Jojoba and its uses held at the University of Arizona in 1986 was a turning point and an eye-opener to the Jojoba revolution thereafter. The ban on Whale oil paved way for the boom of Jojoba wax, which also contains wax esters like spermaceti oils. Being a polyunsaturated wax, the structure of Jojoba oil is completely contradictory from that of other vegetable oils. “Approximately 50 per cent of the Jojoba seed is lipid, not a fat, but a liquid wax. Jojoba is the only known plant in the world to produce such a substance,” quotes Wade C and Edward F Haase. Sherbrooke in their study (University of Arizona) ‘Jojoba: A Wax – Producing Shrub of the Sonoran Desert’. Ayurveda is the pioneer and the oldest of all healing systems on earth including Homeopathy, Siddha, Unani, Traditional Chinese Medicine, Aromatherapy, Chiropractic and Acupressure. Many think that Ayurveda is a complicated medicinal practice. Believe me; no medicinal sciences on earth can be as simple as an Ayurvedic remedy. Ayurveda is not a rocket science but is just a common sense healing methodology. The word ‘Ayur (Life) + Veda (knowledge)’ means the knowledge of life. Self-realization is the ultimate mission of Ayurvedic healing for attaining the vision of longevity and oneness with the Divine. Ayurvedic philosophy states that health is a combination of physical, emotional and spiritual heartiness of a person. Ayurveda never treats an illness or its symptoms, whereas it addresses every individual in a distinct manner and not just their health condition. This is due to the fact that Ayurveda regards every person as a unique creation with a unique individual constitution known as doshas. Every human being is made up of three doshas, namely vata, pitta and kapha. These biological energies are an arrangement of the five vital elements of Nature (Panchamahabhutas – earth, water, fire, space and air). All human beings have a combination of three doshas in a specific composition with the dominance of any one dosha. The predominant doshic energy determines the character, physique, behavioral attributes and spiritual enlightenment of an individual. Ayurvedic philosophy trusts that everything in this universe is a part of nature and retaining absolute balance with Nature paves way for health and disparity leads to sickness. Ayurveda recommends herbs, Ayurvedic essential oils, Pranayama or balanced breathing, Abhyanga or the art of Ayurvedic massaging, yoga, Panchakarma or the Ayurvedic detoxification technique, simple physical exercises, Dinacharya or the Ayurvedic routine, meditation and prayers for treating doshic imbalances. Jojoba is a pacifier and neutralizer of all the three doshas. It is many times prescribed for Abhyanga (massaging in Ayurveda), which is maneuvering of muscles and nerves with Ayurvedic oils using palms, fingers, foot, elbows and certain other conventional massaging equipments. Yes! The wait is over. Come let’s discover the many healing benefits of Jojoba oil for mankind. 1. God of gorgeous skin: Supports skin health and called as Twachya. The heading might sound ‘BIG’ but is not a mere exaggeration, as pure Jojoba oil has admirable and commanding qualities that protect your skin health and prevent it from various infections. Jojoba has supernatural powers and its unique biochemical components make this oil ‘the best’ among various skin care formulations. For its skin supporting attributes, Jojoba is beckoned as Twachya in Ayurveda. Jojoba can be ‘everything’ to your skin and hair. It can be a promising conditioner, cleanser, moisturizer, cosmetic, softener, anti-microbial agent, anti-aging serum, softener, lip balm, sunscreen lotion, shaving gel, body lotion, safe makeup remover, detangling cream, cuticle cream, anti-acne cream, anti-dandruff lotion, hair vitalizing serum, cracked foot cream, stretch mark reducer, scar treatment, wound healer, hair thickener and much more. Ayurveda denotes that Jojoba oil has mild, moist, cooling, light and hydrating properties that are extremely beneficial in the treatment of dry, inflamed and acne-prone skin conditions. Jojoba oil pacifies all the three doshas and is enormously helpful for vata and pitta skin types. With its light and moisture-enhancing abilities, it is safe for kapha dosha also. It can work as a brilliant massage oil that can assist in supporting your overall health condition. Just blend 1 ounce of Jojoba oil with 1 ounce of Coconut oil, ¼ ounce of Olive oil and ¼ ounce of Almond oil. Your magical massage oil is ready for granting you the mesmerizing beauty from within. “People who go for massage experience measurable changes in their body’s immune and endocrine response and experienced significant changes in lymphocyte numbers and percentages white blood cells that play a large role in defending the body from disease,” say researchers of Cedars-Sinai’s Department of Psychiatry and Behavioral Neurosciences. Applying Jojoba oil leaves the positive impression in such a way that the homeostatic regulatory system of the human body recognizes that sufficient oil has been produced by itself. Sebaceous glands are minuscule glands in our skin surface that secretes a wax-like or an oil-like substance called as sebum. The consistency of sebum is much similar to Jojoba oil. The proper secretion of sebum by our sebaceous glands determines the optimal health of skin surface. Age, lifestyle changes, diet and other environmental factors affect the normal functions of sebaceous glands. Decreased secretion of sebum leads to dandruff, hair fall, itchy scalp, dry hair, dry skin, cracked and thick skin surface. ‘Mothers are created on earth as God cannot be present everywhere’ is a divine adage. Why is Jojoba oil beckoned as the ‘Mother of sebaceous glands’? Jojoba oil is an emollient with rich natural wax esters that assist in the secretion of sebum by the sebaceous glands, thus helping in maintaining balanced level of oil in the skin, retaining the natural moisture, enabling the skin to look young and hydrated and leaving the skin soft and supple. Dry skin is a result of lack of moisture or water in the epidermis or the upper layer of the skin surface. Jojoba oil penetrates through the epidermis and keeps it moist and hydrated all through the day. The oil of Jojoba has the potent to enable sebum secretion during shortage and dissolves sticky remains in times of excess sebum secretion. Massaging your skin with 2 ounce of Jojoba oil blended with 5 drops of Lavender oil, 5 drops of Argan oil and 5 drops of Ylang Ylang oil will moisturize your hair and skin and gift you the most spongy skin and bouncy locks like never before. Every problem has a destined root cause. Nothing happens overnight. Thus, treating the symptoms of a specific health condition can grant only a temporary solution. Treating the real root cause paves way for treating it initially and preventing it in the future. This is the secret behind the healing acumen of Ayurvedic medication. “A Father provides the foundation of strength, wisdom and hope. So that his children may build their dreams upon it,” is a celebrated father quote. That is why I personally call Jojoba oil as the father of hair follicles, for its ability to strengthen the roots of the hair, enrich the scalp, clear away dandruff, control frizz, treat alopecia and promote hair growth. Gwyneth Paltrow said, “My father, he was like the rock, the guy you went to with every problem.” In a much similar way, Jojoba oil is a father to your hair follicles as every hair problem begins from its roots and this natural wax treats it better than most other hair care products in the market. Massaging your scalp and hair with 2 ounce of Jojoba oil blended with 3 drops of Rosemary oil, 2 drops of Thyme oil, 2 drops of Lemon oil can assist in controlling frizzy hair problems, controls dandruff and itchy scalp conditions, balances the level of natural oils and sebum in the scalp and persuade hair growth. Unlike other liquids, Jojoba does not evaporate quickly and it amasses and penetrates into the roots of your hair. This aids in conditioning the roots and preventing your hair from turning dull and fragile. Excess secretion of sebum in the scalp might lead to sticky hair, itchy scalp, and invasion of microbes along with dirty and blocked pores that restrict the growth of healthy hair. Massaging your scalp and hair in alternative days with 2 ounce of Jojoba oil blended with 5 drops of Rosemary oil, 5 drops of Clary Sage oil, 5 drops of Cedarwood oil and 5 drops of Almond oil is an excellent homemade blend for augmenting the volume, shine, texture, thickness of your hair and prevent hair loss significantly. Jojoba oil spreads evenly on the scalp, dissolves and confiscates excess sebum deposits, thereby leaves the scalp and hair clean and strong. Excellent care for treating and preventing acne. Acne is the most chronic condition in a teenager’s life, mostly during the peak period, when the young ladies and the gentlemen turn beauty conscious. It is not only a universal adolescent problem but is found in many people even after their teenage years. Acne includes pimples, blackheads and whiteheads in the initial stages, whereas severe acne might lead to inflammation and larger spots on the skin. If not treated in the initial stages, this condition might turn worse by leaving behind acne marks and difficult to remove scars on the skin. The major causes behind acne-prone skin conditions are blocked sebaceous glands with excess sebum, dirt, dead cells, keratin and oils. It paves way for the formation of comedone that looks like a whitehead or blackhead. Blocked sebaceous glands invite bacteria like Propionibacterium acnes that worsen acne and end up in inflammation and spots filled with pus, witnessed by redness and pain. The extremely shocking fact is that numerous studies have correlated the relation between acne, anxiety and depression that might even lead to suicide in teenagers. Can a dermatological disorder like acne end up in suicide? A 2010 study on ‘Clinical implications of lipid peroxidation in acne vulgaris’ by Whitney P Bowe, Department of Dermatology, State University of New York Downstate Medical Center, New York and Alan C Logan, Integrative Care Centre of Toronto, Canada published a detailed study on the impact of acne frequently associated with depression, anxiety and other psychological sequelae and the oxidative stress involved in the pathophysiology of acne. How can Jojoba oil be an effective natural remedy for acne? Tremendous deep cleanser that throws out dirt, surplus oil and microbes in the hair follicles. Aids in clearance of skin blocks by removing the comedone in the skin surface. Regulates the functions of the sebaceous glands. Trusted antibacterial and antimicrobial agent that combats Propionibacterium acnes. Proven anti-inflammatory oil for treating inflamed skin conditions and pacifying skin irritations associated with acne. Rich in Vitamin E and A that nourish the skin cells. WOW!!!! Is your response now? Am I right? Yes!! Only a sister can be a caring friend as well as your second mother. With so many caring features packed in, nothing else than Jojoba can be your ‘LOVING SISTER’ for acne-free clear and spotless skin. A German based 2012 study, published in the Swiss Journal Research in Complementary Medicine proved the effectiveness of Jojoba oil in the treatment of acne, where facial clay mask blended with jojoba oil dabbed 2-3 times every week for 6 consecutive weeks lead to about 59 per cent diminution of lesions in people with mild acne vulgaris. Mix 10 drops of Jojoba oil with 1 drop of Turmeric oil and 1 drop of Tea tree oil and dab it on your acne and leave it for 30 minutes. Wash your face with a mild skin cleanser with 2 drops of Jojoba oil diluted in it. Follow this regimen in alternative days for about a month, visible results are sure to knock your door. Practice Pranayama every day, where 70 per cent of toxic remains in your system are flushed out through conscious exhalation. ‘Sometimes being a brother is even better than being a SuperHero’ – Marc Brown. Your Super Hero brother would always love to keep you beautiful as you are his lovely little princess/prince. Jojoba oil is rich in Vitamin E that contributes to its antioxidant properties. This aids in combating against the free radicals that are responsible for aging symptoms like wrinkles, fine lines, saggy and dull skin. With its exceptional hydrating quality and highly penetrating ability, Jojoba oil protects the skin from the harmful UV rays, aids in treating sunburns, fine lines and wrinkles. Gently massaging your skin with 5 drops of Jojoba oil and 2 drops of Apricot oil and 1 drop of Cucumber oil can help in rejuvenating and restoring your skin health, leaving it look young and beautiful. ‘A friend in need is a friend indeed’ is a lovely friendship proverb and indeed Jojoba is that true friend for you in possessing a blemish-free, clear and fair skin complexion. Jojoba oil controls the production of melanin and aids in treating skin pigmentation. Massaging your face, neck and hands with 15 drops of Jojoba oil, 3 drops of Sandalwood oil and 2 drops of Rose Geranium oil everyday can help in improving your complexion by lightening the skin color. What next? Bright, clear, acne-free, spotless and extremely fairer skin that would make you proud and your rivals to stay envious on you is all yours. Kustaghna – Supports skin health and treats various skin problems. Jojoba oil is undoubtedly tough on microbes and smooth on your skin. It is a great warrior in fighting against bacteria, fungi, other microbes and foreign bodies. These micro-organisms would otherwise barricade the functions of the healthy cellular structure of the skin. Microbes invade wounds, boils, burns, acne and other skin eruptions and worsen its conditions. Bacteria like Staphylococcus aureus enable the wounds to turn septic and delay its healing. Jojoba oil has anti-microbial, anti-fungal and antibacterial properties that curb the growth of microbes and help in the treatment of related skin conditions like eczema, candida, ringworm, dermatitis and psoriasis. It also promotes quicker healing of wounds, burns, itching, allergies and inflammatory skin conditions. How will Jojoba do all these things? Is that the next question striking your thoughts? Then, here’s the answer. Jojoba oil is one among the most light and easily-spreading natural wax that penetrates deep into the skin surface. First, it arrests the functions of microbes and further curtails its growth. Followed by its ‘repairing mission’ where Jojoba oil promotes the natural ability of the damaged or inflamed skin to turn to its normal cellular arrangement with its rich nutrients and chemical constituents. Jojoba oil further normalizes the secretion of sebum by the sebaceous glands, the ultimate secret behind your skin in the pink. All you need to do is to dab the affected areas with 5 drops of Jojoba oil blended with 1 drop of Argan oil to return to your healthy skin regimen. Apart from these amazing benefits, Jojoba oil is also used as a vital ingredient in moisturizing creams, conditioners, shampoos, sunscreen lotions, baby care products, nail and cuticle products, pharmaceutical products, lubrication industry, natural cleansers and an extensive array of cosmetics. Adhere to a wholesome and balanced diet. Simple physical exercises on a daily basis might sound easy but you never know the massive health benefits on your fitness regimen. Linking with the ultimate Divine Force through meditation or prayer for about 15 to 20 minutes a day can help in colossal positive effects on your brain and body, leading you to realize yourself, earn self-esteem and an optimistic outlook of life. Be positive and fulfill your duties or karma for everlasting contentment. Deepen your thoughts with positive thinking and determine to bring a smile in at least one person every day. Fuel your system by drinking plentiful water and juices. Keep smiling; you must have known that ‘Smile is a curve that sets everything straight’ :). This article is destined only for informational purposes and is not meant to diagnose, prevent or treat any kind of health conditions. It is not for replacing any prescription medicines or the consultation of a certified general practitioner. We, at Essential Depot are not doctors of medicine or healthcare practitioners and this piece of information is shared only for spreading the miraculous curing of Ayurveda, the mother of all healing systems on earth. All essential oils are suggested only for topical application and not for internal use. Blend it with suitable carrier oils before use. This is mainly because 100 per cent untainted and organic essential oils are concentrated liquids and may cause allergic reactions if used on the skin without dilution. Care should be taken in using essential oils on children, pregnant or nursing women. Speak with your Ayurvedic expert or medical professional before selecting the appropriate oils for your unique individual constitution (Prakriti) and the state of health (Vikruti). Do a patch test on your skin before enjoying the enormous benefits of essential oils. 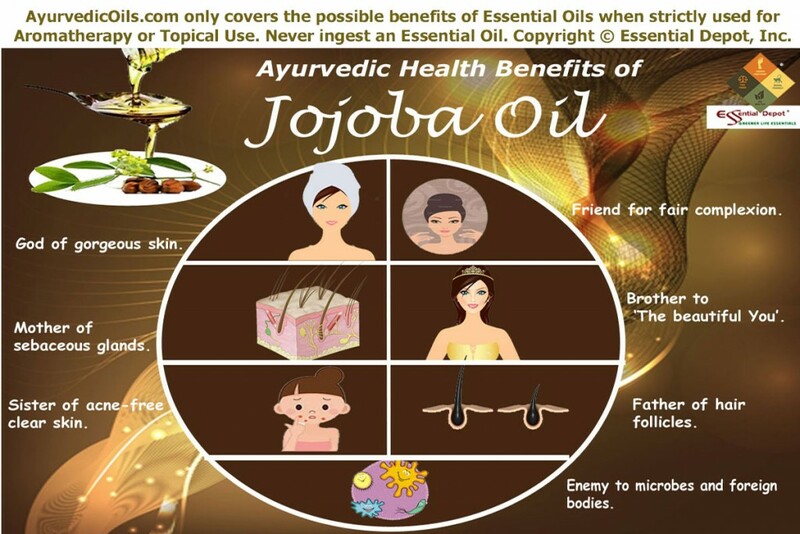 This entry was posted in Essential Oils - Learn About and Purchase and tagged Ayurvedic health benefits of Jojoba oil, Ayurvedic oils for acne-free skin, Ayurvedic oils for aging problems, Ayurvedic oils for alopecia, Ayurvedic oils for clear skin, Ayurvedic oils for dry skin, Ayurvedic oils for fair complexion, Ayurvedic oils for hairfall, Ayurvedic oils for thick hair, Ayurvedic uses of Jojoba oil, Best oils for wrinkles, Chemical constituents of Jojoba oil, Health benefits of Jojoba oil, Jojoba oil for acne, Jojoba oil for dandruff, Jojoba oil in Ayurveda, Jojoba oil in hair care, Jojoba oil in skin care, Natural moisturizers, Natural remedies for dry skin, Natural remedies for pimples, Simmondsia chinensis, Therapeutic properties of Jojoba oil by AyurvedicOils. Bookmark the permalink.